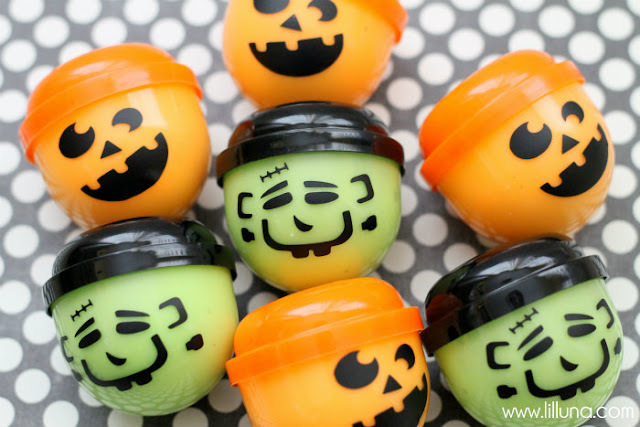 These Halloween gak treats are a great alternative to giving out candy this Halloween. They would be a super fun Halloween party favor too. Sadly, I will never ever make these. I have a strong stomach. I don't gag easily. I can ride roller coasters, fly in planes, jump out of planes, clean up puke, see blood. No problem. But homemade gak and homemade slime...I cannot handle them. My son has never in his life gotten to play with either in our house. Isn't that sad! I might steal the fun idea for the containers and just fill them with candy though! So if you want to use the cute idea for the containers or have a stomach that can handle gak, I am sure the boys in your life would love you for these. You can check out the Halloween gak favors over at Lil' Luna.